Last December, the Brazilian National Confederation of Industry (CNI) presented to the new government a document listing 36 actions identified as priorities for the first 100 days. The pillars of the 100 days Agenda are the balance of public accounts, increase state efficiency, improvement of the business environment and economic growth and job supply stimulation. “The elected government needs to use the political capital of the election to move the country forward and secure a new cycle of growth. The longer the reforms are postponed, the greater the costs for society”, said Robson Braga de Andrade, CNI President. 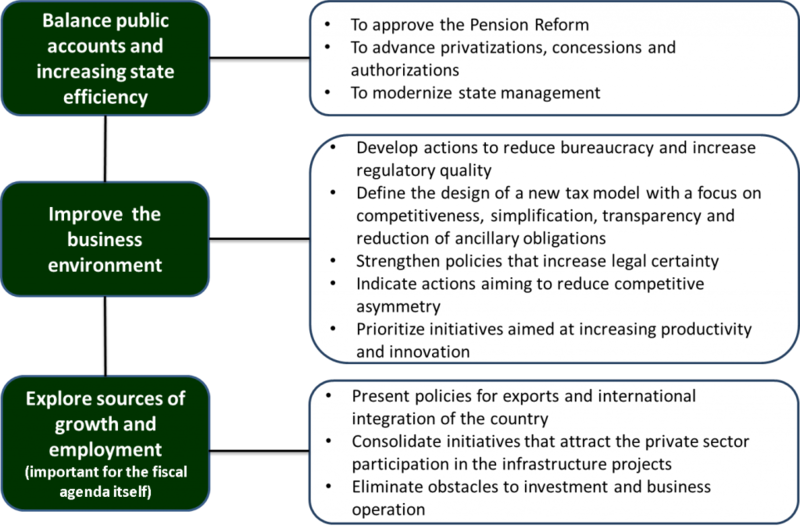 The priority agenda includes proposals in a wide range of areas, such as fiscal measures, competitiveness, legal security, public safety and education. The actions the industry identified as priorities for the new government were built upon 43 proposals that CNI presented last July to all presidential candidates. “The actions needed to put the country back in the path of economic and social development are clear. It is necessary to implement the reforms, especially the Pension and the Tax reforms; to remove the red tape and invest in partnerships with the private sector, to promote the increase in productivity and to expand Brazil’s international participation”, summarized Mr. Andrade.